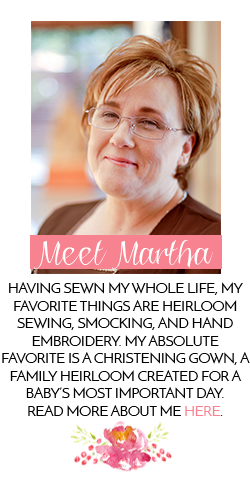 Southern Matriarch: Spring is here! At least on the calendar. Gorgeous day yesterday, mild, blue skies, sunny. Today? Grey, drippy and cold. The promise is there though. 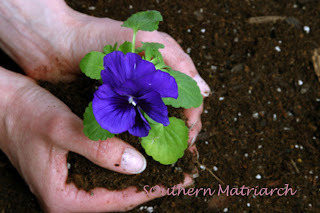 Time to begin thinking about flower beds and uncovering the yard from winter debris. There is such promise in spring time. Almost more so than New Year's. I think New Year's should be in the spring. It would make more sense to me. As the ground gives way to rebirth, so would the calendar. Like many things in life, I was not consulted. 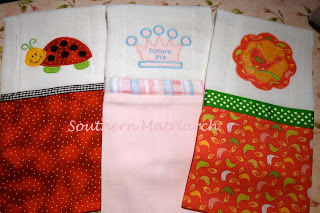 more burpcloths! I think I may have the applique thing down. Again the fabrics are from stash and the ribbons are little prizes. I often order fabrics and they will often come wrapped as a gift almost. Tied with ribbon. I save the ribbon and have found good uses for some of them here. 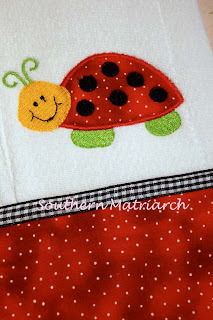 A friendly ladybug trimmed with gingham ribbon and a polka dot fabric left over from a redwork quilt. She looks friendly don't you think? Triple appliques!! Watch me run with something. 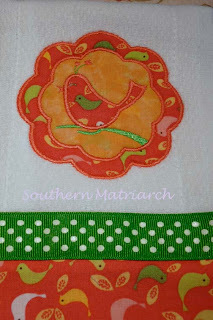 Pretend like you don't notice that the bird fabric for the undermost applique is sideways. Trimmed with some more of that poka dot grosgrain and a fat quarter of cute bird fabric. Every princess needs a crown. This one represents her momma's sorority. Trimmed with plaid ribbon and a lined pique fabric. A faithful reader asked for the source of the baby carriage design in a previous post. It is from an OESD disk. I can't find it online anywhere to point you in the right direction. I bought it several months ago from a local vendor. You go into the store and can choose a variety of designs for them to load onto a CD. That is all the info I have on it. Sorry. Hope spring is arriving in your world even if in little ways. Take notice of the tiny leaf buds on the trees or the hint of green struggling to break free under the leaves of last fall. I'm excited about spring too and want to dig. I'm going to pretend I could find the sideways fabric you mentioned. I did see the perfectly placed little bird on the big bird though! These are such fun designs. The ladybug definitely looks friendly! Look at you go, Marth!! Each one is cute, cute but the ladybug one is my favorite! I would NEVER have noticed the sideways fabric if you hadn't mentioned it. You're doing a great job with these! Spring is still a few months away really... :( Well for me! I love that you are going gangbusters on these burpcloths. Guess I can put mine away as you do not need me to do any for you! Thanks loads for the OESD info. Went on the site and but in carrisge and here it is. Buy 1-4 designs at $9.99/ea or 5-7 designs at $7.99/ea. So guess I need to do some looking on the site to see if there are other designs I need to purchase to lower the price of each design. Thanks again. I can't wait to do this white on white for a new "GREAT" niece or nephew due in Mid Nov in Reno, NV. We already have the Christening Gown, emb slip, & bonnet as well as 2 pairs of booties (small & 3 mo) & bib with elegant embroidered cross that we made for the first one 11 months ago. We also purchased a beautiful white shawl with a lsarge appliqued cross and found matching socks with the applique cross. 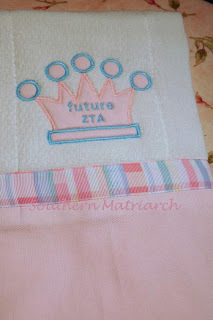 So a new personalized bautiste quilt with the carriage and the family nane would be really a nice addition. Weather boy or girl. Hoping for another adorable girl to sew for. I sewed for the mother most all her life. Thanks again for the quick response. I am off to go shopping!!! By the way Spring has been vacationing out here for several weeks. It has been 80-85 all last week. I am in a sleeveless top and thinking might turn the a/c on for a little while. om has an amaryills & Iris buds that should bloom for Easter. She has Pink roses blooming galore at the front door rose bush.